One thing that recent events have made clear is that our establishment does not play fair. 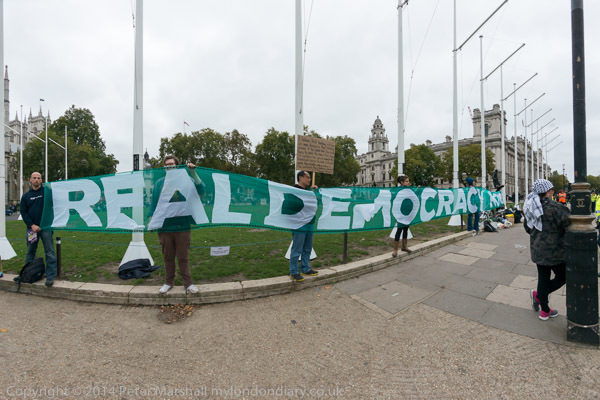 We may officially laud our great traditions of freedom and justice and the rule of law and be given to thinking of Britain as the mother of democracy, but underneath this veneer is a system by the rich for the rich, who when they see their interests in any way threatened are prepared to lie and cheat in any way possible to protect those interests. We’ve seen it revealed a little in the content of the Wikileaks and the curious treatment of Assange and later Snowden, in the snooping of GCHQ and the malware they have introduced into some major computer systems, and, at a more local level in the responses to the relatively trivial scratchings of the Occupy movement, most recently over Christmas over the ‘Love Bank’ on the Charing Cross Road, when police defied a High Court order openly obtained by the protesters while enforcing two obtained by a rather doubtful and secretive company. And we saw it too in October, with the excessive over-reaction to a smallish group of people who came to debate and hold workshops on a neglected area of grass in the middle of Westminster. I’ve long regarded Parliament Square as a national disgrace, in a World Heritage Site, surrounded by some truly iconic buildings, for many years it was only possibly to access by taking one’s life in one’s hands and dashing across three or four lanes of rather unpredictably moving traffic. Even now, the access to the central square is poor, and those who don’t know the traffic lights and lanes well – including the many tourists who come there – often find themselves having to run for their lives as they try to get on or off it. We should long ago have had a great competition for the redesign of the square, which could well have incorporated suitable anti-terrorist measures for Parliament in a far less obtrusive and even attractive way than the ugly black metal structures the currently impede movement by visitors around Parliament. For more than ten years, the front of the square was enlivened by the presence of one man, peace protester Brian Haw, who, along with a few friends kept up a constant presence their as a reminder of the human results of some of the policies pursued by the Parliament opposite. It wasn’t always a pretty sight, though it – or rather a reconstruction of it – did for some months occupy space in the Tate Gallery – but it was always thought-provoking, perhaps why it upset our establishment so deeply. They ordered the police to bend existing laws and carry out raids on the small camp, even drafted a law almost entirely aimed at Haw’s removal (though they made a mess of it), made numerous arrests, sent round thugs and variously otherwise persecuted Haw and his fellow protesters. After stress and cancer killed Haw, they continued the persecution against Barbara Tucker, who came close to death after they removed her ‘sleeping equipment’ and protection against the winter weather. There must be something more than meets the eye about Parliament Square. I have a small suspicion that there is something under that always poorly kept grass that we don’t know about, some secret bunker or dark and grisly secret that our authorities are in constant fear might be discovered by anyone staying there overnight. Though having once spent a rather uncomfortable night on a bench there (they have now removed them all in case anyone should follow my example) I can assure you that neither Churchill nor Mandela come alive at dead of night and walk around. 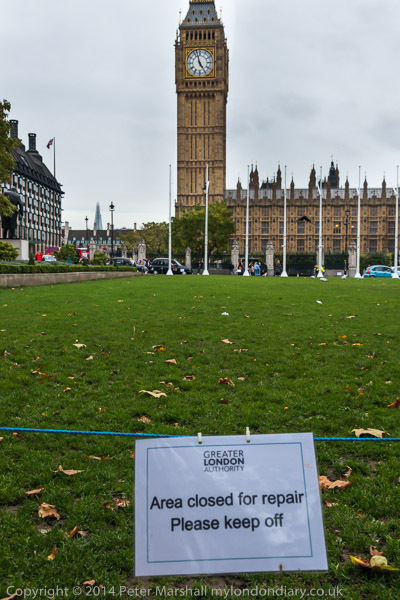 A day before the event was due to begin, the grassed area of the square – which had been neglected all year – was roped off and notices put up by the Greater London Authority (GLA) ‘Area closed for repair – Please keep off’. It was a notice that fooled no one, and there was not even any attempt to make it in the slightest convincing by having any groundsmen or gardeners working there. A month later, well after police boots had churned up the muddy surface thoroughly I could see no indications of any action to repair the area. 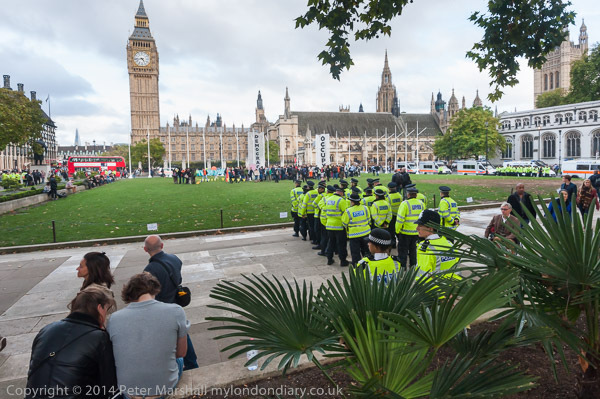 The policing at the start of Occupy Democracy was not particularly unreasonable, although police liaison officers did hand out notices about the unreasonable Parliament Square Garden Byelaws 2012 and Section 143 of the Police Reform and Social Responsibility Act, which make it a criminal offence to use “any amplified noise equipment”, to erect or use tents or other structures designed or adapted for the purpose of facilitating sleeping, or to bring into or use any sleeping equipment in the square for the purpose of sleeping overnight. 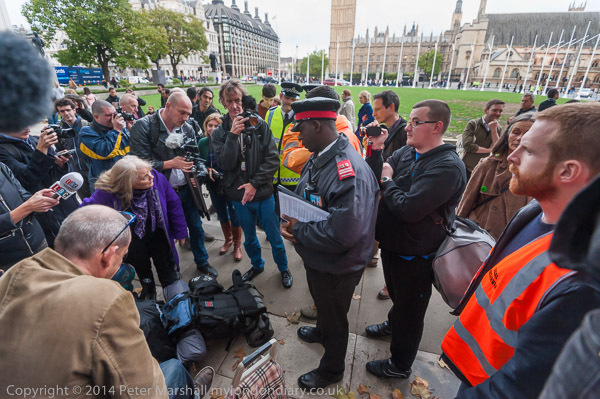 Where things started to go wrong at the beginning was when the private security guards who are provided by a company who have a contract with the GLA – misleadingly titled ‘heritage wardens’ – began telling police they should start taking rucksacks and sleeping bags from people in the square, even though at that point they were not attempting to use them in the area. And that police, rather than behaving as they should and deciding for themselves whether an offence was being committed, simply acted as the enforcement for the warden’s whims. People rightly objected, argued and peacefully resisted – and eventually, for the moment, the police backed off, and the entirely peaceful event took place – and was still proceeding an hour or to later when I left for home. The next morning when I arrived, people were still on the square, some having spent the night not on the main grass area but on some areas around the edges, following some negotiation with police. People were still more or less keeping off the main area of the square, and most had left to join in the large TUC ‘Britain Needs A Pay Rise’ march, with a small group holding banners and placards and chalking on the pavement facing the Houses of Parliament. I returned after watching the march leaving the Embankment – it took over and hour for everyone to start on their way to Hyde Park, and went back to Parliament Square. 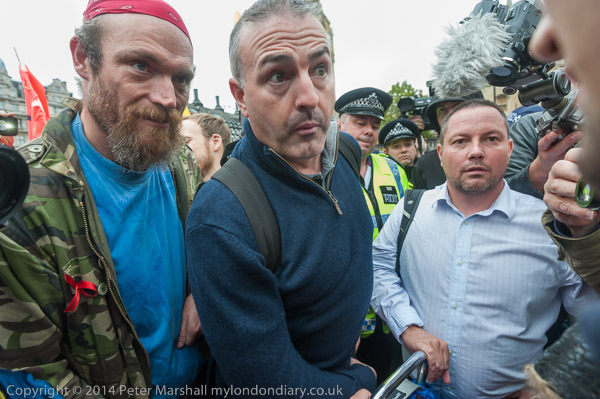 Soon things began to heat up a little, especially when a Heritage Warden and Westminster Council officials attempted to seize a small amplifier playing music that some protesters were dancing to. Although the bylaws prohibit “any amplified noise equipment”, it isn’t something that is generally enforced in the area and certainly not against groups that are causing no problems – as in the case of these dancers, who were unaware of the prohibition. Eventually after much argument, police intervened with the council officials and the people concerned were told to take the equipment away and not bring it into the square. Around half an hour later, the main group of protesters arrived, and simply ran onto the square in numbers sufficient to make it impossible to stop them. A rally then began with speeches by Labour MP John McDonnell, Occupy’s George Barda, environmentalist Donnachadh McCarthy, Russell Brand and others, while more and more police arrived and stood in blocks of twenty in various positions around the square, apparently just waiting for the order to charge. One large group of officers in blue caps seemed very much to be looking forward to a fight. To my surprise, nothing happened. 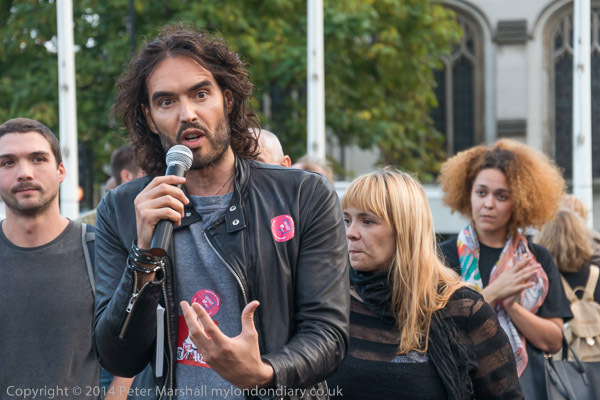 At least not while I and the rest of the press were there in force (particularly as Russell Brand was there. Suddenly I saw the officers getting into their police vans leaving the square. Where there had been perhaps 200 officers, there were now around 20. When I left (to go to a protest elsewhere) the rally was continuing. I expected the police to take action in the middle of the night to try and remove the protesters from the grass area. 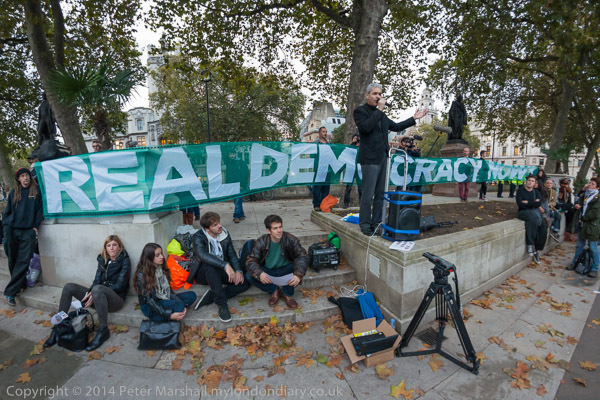 You can see more pictures from the Friday Evening and Saturday at Democracy Camp starts with rally and Democracy Camp takes the Square. This entry was posted on Saturday, December 27th, 2014 at 08:52 am and is filed under My Own Work, Political Issues. You can follow any responses to this entry through the RSS 2.0 feed. You can leave a response, or trackback from your own site.